HPF-D027/HPF-D033 Series Probe Type Liquid Level Fiber Units. 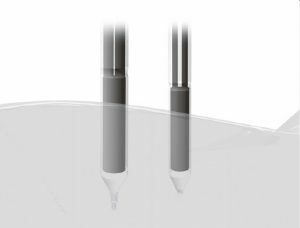 These contact type liquid level fiber units have a proprietary tip structure that reduces malfunction due to liquid clinging. The units are PFA jacketed and there is a small-diameter version designed for easier cable routing. The units are especially effective when paired with the HPX-EG amplifier’s auto sensitivity functionality.